We’d usually provide traditional decorating tips, colour ideas and more. 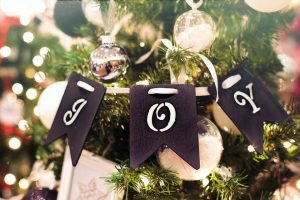 However, with Christmas just around the corner, we thought we’d share our ideas on how to inject some festive fun into your home this year. Opening a traditional chocolate advent calendar each day is one of the perks of December, but why not make this tradition extra special? Get yourself a piece of twine, or string, and tie 25 mini muslin bags to it, decorate your bags however you wish and number them 1 to 25. Now all that’s left to do is hang your handmade garland in a place you choose. This way, your advent calendar not only becomes a unique decoration, but you can also fill it with whatever you wish, from notes to sweet treats and little gifts. The kitchen is often left a bit bare in comparison to rooms such as the living room, but it is sometimes the room that the most time is spent in on Christmas day. To decorate the kitchen, without overcrowding the space or causing a hazard, consider hanging mini wreaths on each of your kitchen cupboard doors. If your kitchen space is limited, using a simple festive garland at your kitchen window and changing your usual tea towels and cups to festive additions can add a sprinkling of festive cheer, whilst remaining practical. Statement walls are great for people that want to confine their Christmas decor to one area of the home and also for those jumping head first into the festive season. There are many ways to create a statement wall, but a mix of paper, metal and wooden stars hanging from twine at different heights will create a 3-dimensional gallery that you can keep up all winter. You may also want to use a curtain of fairy lights to cover the backdrop of the main wall for extra sparkle. Sadly, we don’t specialise in decorating homes for Christmas, however, we can ensure that all those decorating jobs you’ve been meaning to get round to are finalised before everyone arrives. Whether its fence that needs painting, the outside of your house or the walls and woodwork inside your home, we welcome you to contact us. Please call our dedicated team today on 01234 857057 or send your enquiry through to our online enquiry form.